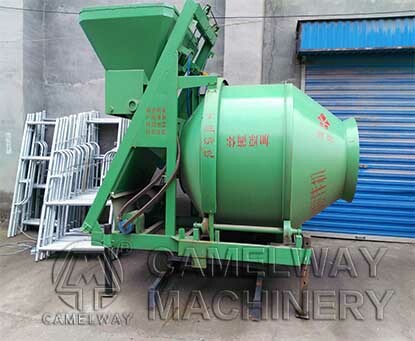 The concrete mixer should be placed in the flat place, which can avoid movement when the machine is working. The secondary leakage protection should be implemented. When the power is turned on, we must check carefully. The revolving speed of empty machine is faster 2~3turn than the machine which has been charged. If there is a large difference, we should adjust the proportion of wheel and driving wheel. 3. The direction of rotation of the mixer drum should comply with the arrow direction. 4. Check whether the driving clutch and the break are flexible and reliable, whether the wire rope is damaged, whether the track pulleys are in good condition, whether there are obstacles around the machine and whether the condition of lubrication of all parts is good or not. 5. After turning on the machine, we should observe carefully whether the operation of all parts of the machine is normal. Keep the machine clean and intact. After work or when we do not use the concrete mixer, we should switch power off and lock the switch box well to ensure safety. If you are interested in our products, you can contact us. Please feel free to contact us via email or at the contact addresses available on this website.